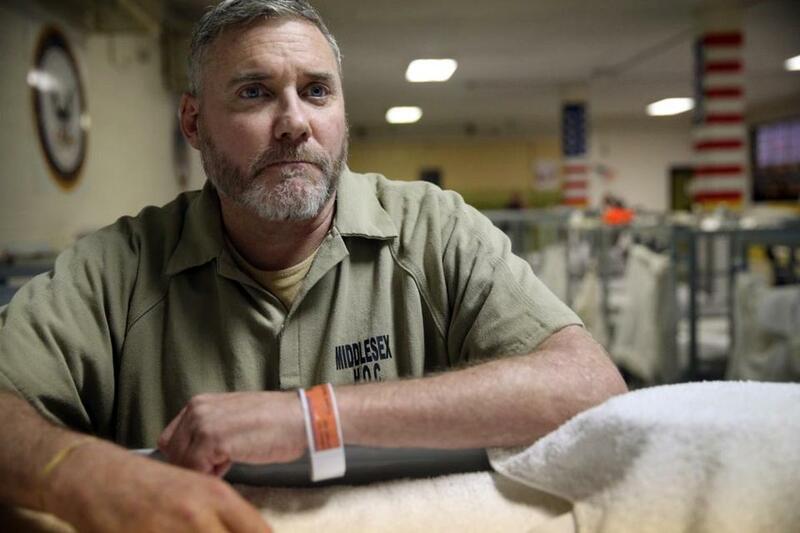 “There’s a plan for when you leave, something waiting for you,” said inmate Kevin Faherty, an Army veteran. A couple weeks ago, the sheriff of Bristol County got a lot of attention when he offered to send some of the inmates in his care to help build a wall along the Mexican border. The idea was preposterous, impractical, and highly politicized, so of course it got a lot of publicity, generating all sorts of heat and very little light. In contrast, for the past year, with hardly any attention, Middlesex County Sheriff Peter Koutoujian and his staff have developed an innovative approach that is transforming lives for the better, lowering recidivism rates and raising the odds that those who have served their country can become more responsible, productive citizens. Friday marked the first anniversary of the Housing Unit for Military Veterans at the Middlesex jail and house of correction, the first of its kind in New England, and really the only one quite like it nationwide. Its acronym is HUMV, or Humvee, an armored vehicle that once protected many of the younger vets in the unit. Koutoujian tapped Paul Connor, an Army veteran, to run the unit. They got a waiver from the state, so that pre-trial prisoners and inmates already serving their sentences could be housed together. The HUMV is set up like a barracks, bunks lined up in the self-contained unit. The walls are lined with the insignias of the five service branches and other military images, including the flag raising on Iwo Jima and a poignant, haunting image of St. Christopher watching over a kneeling soldier. The men in the unit are broken down into squads, sharing chores and other duties, which builds camaraderie and accountability. Not every veteran in the jail population is selected to join the unit. It can hold up to 54 men, but the most they’ve had at one time is 38. Veterans from every conflict era since Vietnam have served time in the HUMV. Connor’s veteran status makes a real connection with those in the unit. His decade of sobriety, meanwhile, makes him a role model. Like the vast majority of inmates in the general population, most of the vets in the HUMV have struggled with alcohol and substance abuse. 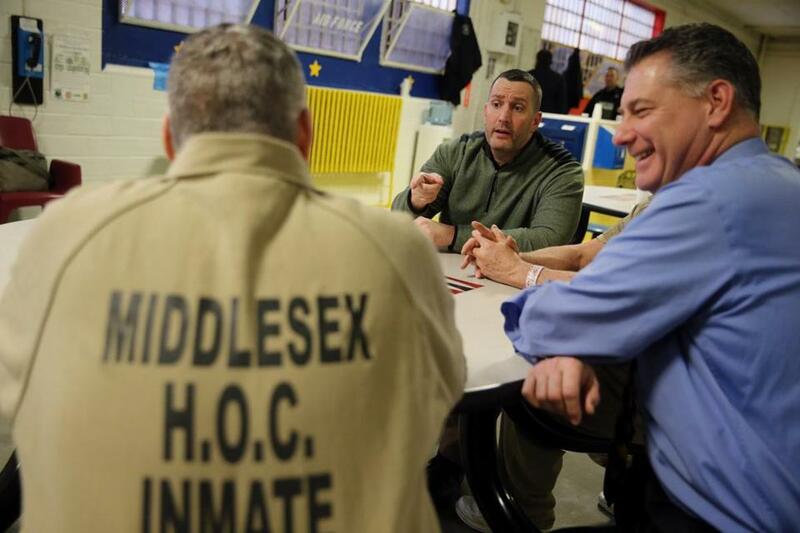 From left: Faherty spoke with Paul Connor, veteran services coordinator, and Middlesex County Sheriff Peter Koutoujian at the jail earlier this month. Alcoholics Anonymous and Narcotics Anonymous meetings are mainstays in the HUMV, and there is a regimented daily program to build skills and confidence, plus daily physical training, which they remember from boot camp and their service days. Many of the vets credit the cognitive behavioral therapy sessions with pushing them forward. Amy Bonneau, a social worker from the Boston Vets Center, runs a support group at the HUMV. Connor, still a captain in the National Guard, puts it in terms that everybody in the unit understands. Billy Matthews and Kevin Faherty can attest to that. They both served in the Army, and they both ended up in jail because of booze. They immediately noticed the difference between being in general inmate population and the veterans unit. It is hard to explain and impossible to ignore the way the vets feed off each other. Billy Matthews says it’s like that old soldier’s credo: no man left behind. Sitting at a table with Faherty, Matthews pointed to Paul Connor across the room. “Paul’s not leaving us behind,” Billy Matthews said, and Kevin Faherty nodded. The HUMV’s reputation is getting around. Judges from the state’s five veterans courts are now sentencing vets from other counties to the Middlesex unit. Veterans from Suffolk, Worcester Essex and Norfolk counties have served time in the unit. While still compiling data, Koutoujian says initial research shows that the 119 veterans who have passed through the HUMV have a considerably lower recidivism rate than the general population. Other counties and the state’s prison system are watching the HUMV closely, and once the official data is produced, look for this model to spread far beyond the jail in Billerica. Koutoujian and his staff hope to apply the model to other subsets of the jail population, such as young offenders. Koutoujian was marching in the Labor Day parade in Marlborough last fall when he heard a guy in the crowd shout out, “Humvee!” Koutoujian walked over to greet the vet, who had been released from jail a year earlier than scheduled because of his participation in the HUMV. He was working construction, was sober and doing well. The guy had a plan. Billy Matthews, 66, a carpenter by trade, has a plan when he gets out in a few weeks. There’s another vet he became friendly with in the HUMV. That guy’s already out, and they’re going to go to meetings together. There’s a good meeting at the VFW in Saugus on Sunday mornings, and after that they’ll go out and grab some breakfast. Now, that won’t generate any headlines, but it’s a plan. 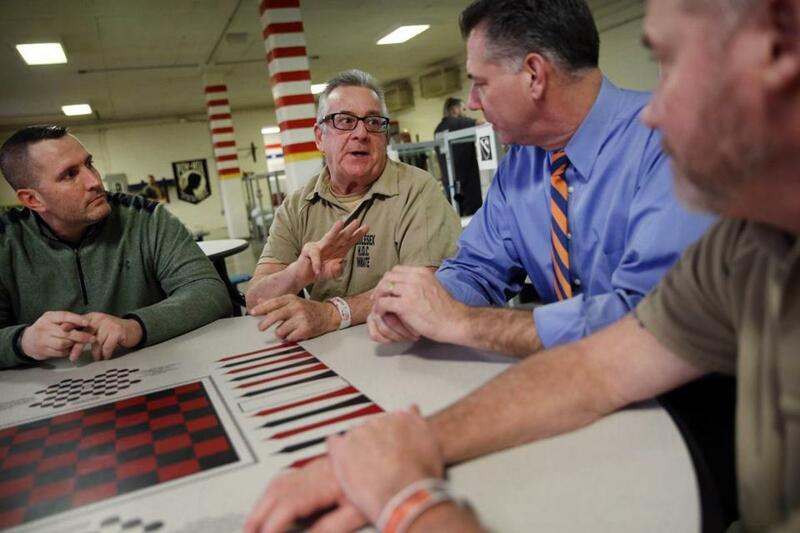 From left: Connor, inmate Bill Matthews, Koutoujian, and Faherty talked in the Housing Unit for Military Veterans.